Shop Didriks: New York Times' "Cold Nights Ahead"
If you happened to look out the window last night around 7pm, you would have seen the first snowfall of the season. Temperatures are in the mid 20's, wool coats can be seen on the commute, and I had to wear my leather gloves to ride my bike to work this morning. Winter is here, nevermind the Winter Solstice that marks the official change in season from autumn to winter. 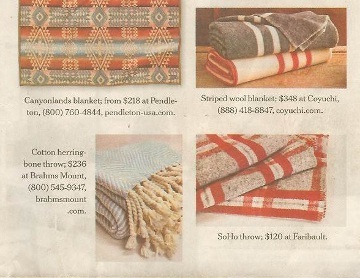 With the cool, nay cold, weather, curl up on the coach with a beautifully woven and ever cozy Brahms Mount herringbone throw as suggested by the New York Times in the October 20th issue in their Home section.